Yesterday evening, after the chaos of teatime and as I was manically tidying up the mess, the kids were playing around me. I’d only popped out to dispose of a black bin bag but when I came back in, I found Oscar and Flo playing with the bin itself. My first thought was to tell them that that probably wasn’t the best of ideas, mainly because I wasn’t sure when the last time was that I had given the inside of it a good clean (apologies Mrs Hinch). But as I heard the fits of giggles they were both in and knowing they were about to have a bath, I decided to leave them to it and watched on. They were finding it hysterical, you see. We have one of those retro dustbins with an actual lid that you can take off and on and they were taking it in turns to climb in the bin, crouch down and then the other would put the lid on. They’d both then crack up laughing, tap on the lid and the person inside would jump out like a crazed jack in a box. Funny a couple of times you might imagine but I kid you not, this went on for 25 minutes straight! Alfie, (Oscar and Flo’s 5-year-old brother) at this particular point last night, wasn’t in the least bit interested in their seemingly childish antics. He was happy playing with his Lego, looking on occasionally and letting out the odd smile, trying desperately hard not to find it funny. But it got me thinking about the relationship these three have and how 6.5 years on (and by that I mean, after Oscar was born) and we’d heard about his diagnosis, how differently the reality of my life is now, to how I would have pictured it would be, then. Before I knew Oscar, I associated Down Syndrome with sadness. I thought that anyone who happened to have Down Syndrome or anyone who happened to be a parent or sibling of a child who had Down Syndrome, would always be sad too. Because how could they possibly be happy I thought? I thought about that and how that had been my outlook and then I thought about Oscar, Alfie and Flo. How Oscar and Alfie are the pair of brothers to build dens together, ride their scooters at speed together, ski together, climb trees together but that if Oscar gets into trouble, whether it be that he can’t quite reach for that branch or falls over on his skis, Alfie’s the first one to help him. He’s his fiercest protector. And then I thought about Oscar and Flo. How they’re the twosome you’ll find sitting having a tea party with one another. Pouring each other and the crowd of teddies around them a cuppa, with Flo talking AT Oscar and him agreeing with the odd ‘Yeah’ where he can get a word in edgeways of course. Something that perhaps other almost 7-year-old boys would find ridiculous now, in that playing tea parties with their little sister would be deemed babyish… yet Oscar loves it. I love that Flo has that in Oscar. When Oscars sad, Flo, at 3 years old and 3 years Oscars junior, in a softly spoken sweet sounding voice, usually reserved for her toy babies, will ask ‘Are you ok, Oggie?’ She loves him so much. So, when I think back all those years ago, I’m pretty sure I thought that other people looked at people with Down Syndrome and felt bad for them too. 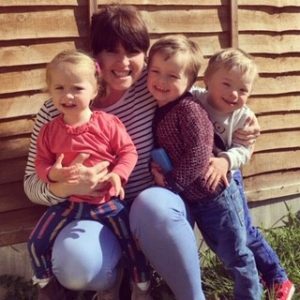 That they felt grateful that they didn’t have anyone with Down Syndrome in their family because how awful would that have been? Yet when I see Oscar, Alfie and Flo together, I actually just see, that it’s exactly as it was meant to be. I also now look at the people around us; and by that I mean my family, my extended family, my friends, my friends friends and I don’t feel that at all. All I think and feel when I’m around them with Oscar, is love and a whole heap of people who’ve had their eyes opened by Down Syndrome. I like to call it the Oscar Effect. I could never have imagined the effect Oscar would have, not only on my life but the people around us. How all the people he comes into contact with on a day-to-day basis – his classmates, his teachers, my friend’s kids, the professionals, even the guy who comes to wash our windows or the man who quoted on a blind for our front hallway this week… the effect he has on all of them. Via my blog and social media pages I am messaged all the time by people telling me that we as a family but more specifically Oscar, have changed their opinion. How he’s opened their eyes to difference and that there’s nothing to fear. Back before I had Oscar I had no idea that people who happened to have Down Syndrome would marry. I don’t think I thought of them having jobs or leading full and fulfilling lives like the rest of us do. Equally before I had Oscar, I don’t think I really gave Down Syndrome too much thought. Why would I? I didn’t know a lot. I didn’t need to. Disabilities didn’t happen to families like ours, I must have thought. So that day, the day he was born, the day where the wind was taken out of my sails and my heart felt like it might break from the pain that came with his diagnosis, although it took me some time, I stopped, took stock and looked around. Because it was those people around us that made me see the effect he was having. And from that very point, the Oscar Effect has trickled on through. Slowly, slowly I see the change. To the other families in the park who see us, who before Oscar came along wouldn’t have come into contact with a family like ours. The cashier in Sainsbury’s who now sees Oscar as a little boy, not his diagnosis. They’ve all changed their minds and outlook now. It might be on a small scale but look at what he’s done. Look at all those lives he’s touched. You’ve done this Oscar. The Oscar Effect.